This seems to be crape myrtle time in my garden. I have ten of them in this small space, and they are providing wonderful color just now. Most of the crape myrtles are shedding their bark at this time of year, but ‘Osage’ always shines as it reveals this beautiful new color. It will eventually fade to gray but will keep this color for many months. A few other flowers are in bloom now; you have to look closely because it is hard for them to compete with the crape myrtle. 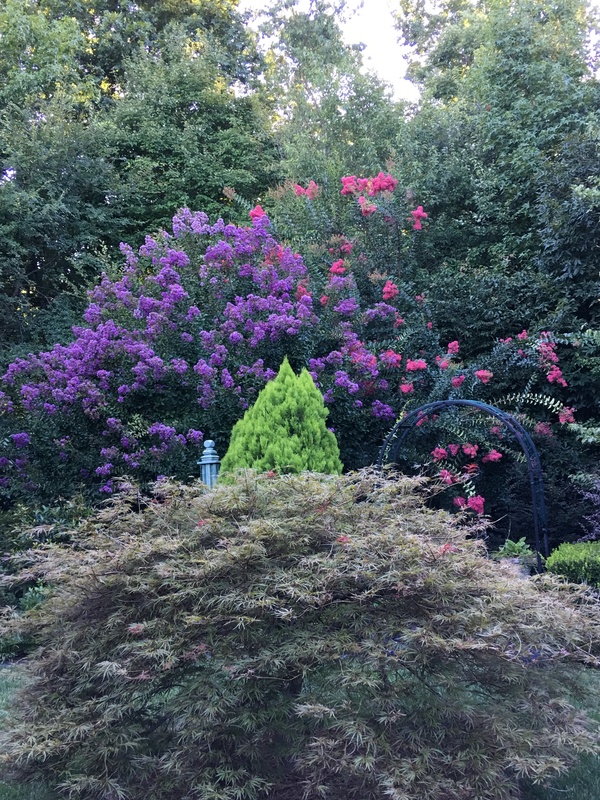 This entry was posted in End of the Month View, Gardening and tagged crape myrtle. Bookmark the permalink. 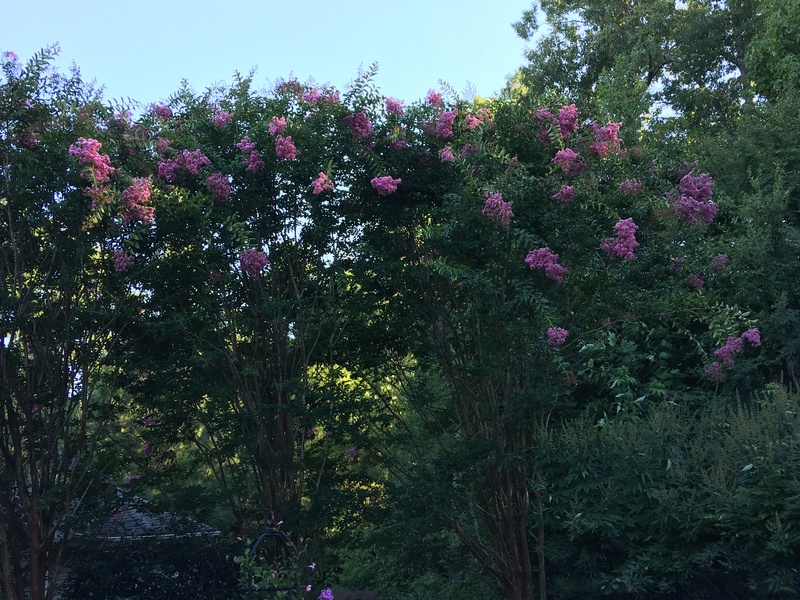 Your crape myrtles are amazing! Such variety, and I well remember how interesting their bark is in many seasons. Enjoy. Thanks, MP. 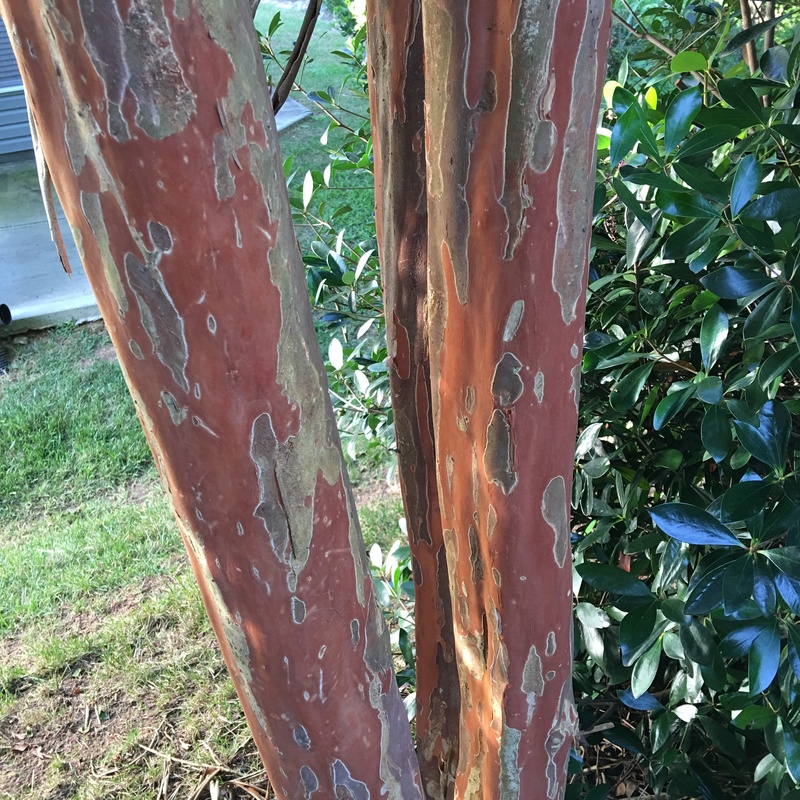 Natchez is another crape myrtle that has lovely bark…plus white flowers. Don’t know about fairies, but I love it. Wow, John. This is gorgeous. Thanks, Cynthia. For the crape myrtles in my garden, this is prime time. I always enjoy a walk in your garden! You are most welcome to join me at any time. Lovely. One of my favorite trees. Thanks, Marie. Glad you like it. Your crape myrtles are really stuinning, giving your garden lots of lovely colour at this time of year. Thanks, Pauline. They really carry the garden at this time of year. The Lagostroemias are wonderful. Do you irrigate them or do they have enough moisture from the humidity in the air. I’ve watered mine a lot this year and have been rewarded with masses of flowers on the white one. I don’t do any special watering, just rely on the rain. Established plants don’t need any more. He causes it to rain on the just and the unjust. The crape myrtle are all lovely and the bark is certainly an added bonus! Thank you, Cathy. Not all crape myrtles show such wonderful bark. Could these be even more beautiful than last year? 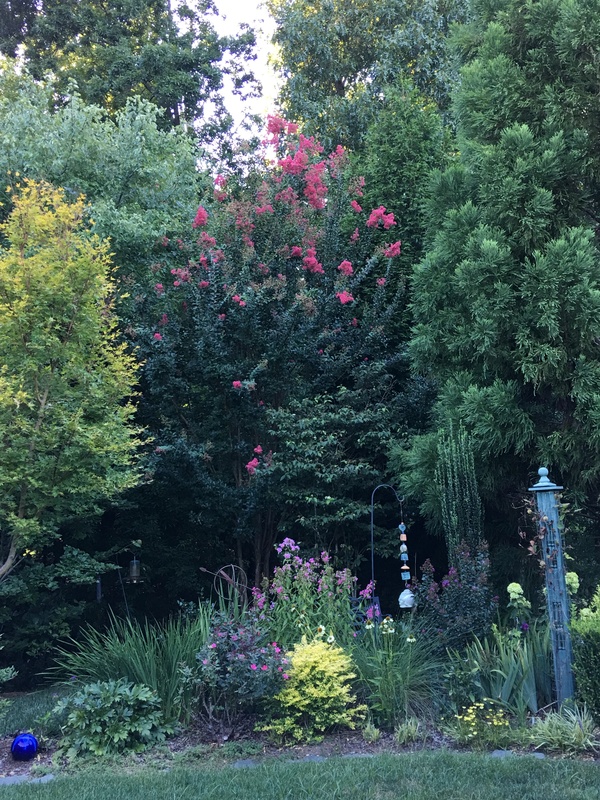 I’ve taken a risk and given yet another crape myrtle a chance in my garden. The winters have been so mild I think it might be worth it to try again, still I don’t think there’s any chance I’ll see bark like that! I wish I could smell the gardenia. I hope they work for you. They are so lovely this time of year. Good on you, Steve. Unfortunately, you have caught me on a day full of rain all day long. Perhaps next month.